Local voters in south and east Auckland have determined what needs will be addressed in their communities with Z Energy’s Good in the Hood funding. And those supporting the needs of children and their families in our community often came up on top. During May, customers voted for how funding should be split between 54 local groups supported at Z stations in the south and east. Each charity received a proportion of the $4000 allocated to each service station in addition to a national Fuel Day where 6c per litre was donated to Good in the Hood, making the total given away on the day more than $84,000. In addition to the monetary funding, Z Service Stations in the area, operated by Wayne and Melanie Kennerley, also created a ‘Mountain for Good’ for the South Auckland Christian Food Bank. Their initial donation of $1000 of food items was built upon by Reremoana School in Wattle Downs which added 430 cans from a Food Bank day and then guests attending the Z event also generously supported with food items. The cheque presentation event started with a Waiata from the Reremoana School Kapa Haka group and was followed by cheque presentations to all sites. 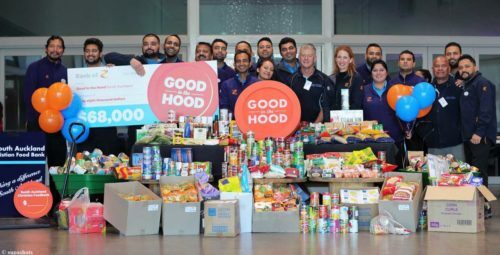 Melanie Kennerley, Community Champion for Kennerley Retail Investments, spoke on the history behind Good in the Hood and its long-standing relationship with the South Auckland Christian Food Bank. The Good in the Hood community funding programme awarded more than a million dollars this June to around 800 Kiwi groups across New Zealand doing good for people or the environment in the area around every Z service station.